This is a new pattern by Tessuti Fabrics, called the Kate top. It might look like a simple boxy top pattern, but it actually has a few unexpected, yet elegant design details. And then, of course, I went and added a few more of my own. The pattern includes a back placket, hem, and side slits and instructions on how to make the inside of the top as beautiful as the outside. It’s these extra details that make Tessuti patterns great. It’s quite obvious that they are written by those with decades of experience in sewing and patternmaking. Since this was a competition, I felt it was important for me to complicate this simple top as much as possible. I used a remnant of silk (perhaps CDC) that I scored off the Tessuti remnant table about two years ago. Silk is a perfect choice for this top, but given the fact that I added a few complicated seams and stripes, it turned out to be a challenging choice. I added two curved panels in the top section of the front, a waist panel, as well as a creatively shaped panel above the hem. With the bottom panel, I tried to follow the shape of the hem, including the way it sharply turns at the side splits. My intention was to flick the fabric grain on it’s side in order to use the direction of the stripes as a contrast feature in the panels. I’m not entirely happy with the fit of this top on me, but it is pretty good for a first go, and certainly very wearable. I didn’t muslin it (pure laziness on my behalf) and just guessed at the adjustments I’d need. I started with a size S, widened the back a smidgen, and tapered the sides in towards the hem by about an 1.5inches. I also lengthened the body by an inch. These are all standard modifications I make to any pattern. I should have reduced the bust dart before I started. The dart seems small enough but I forgot to consider the fact that this top is boxy by design, and probably contains enough ease without the dart for an A/B cup. See how beautifully it fits Lara of Thornberry with her more ample bust. I compensated mid-construction by arcing the side seam in at bust level. This worked quite well at correcting the fit on the fly. Next time, I’ll do a poper SBA, widen the back more, and drop the armscye a smidgen. And if you are wondering why I look so miserable in these photos. The frosts have arrived. My garage was the warmest photo option at about 2 degrees Celsius. I’m really surprised you can’t see my goosebumps! 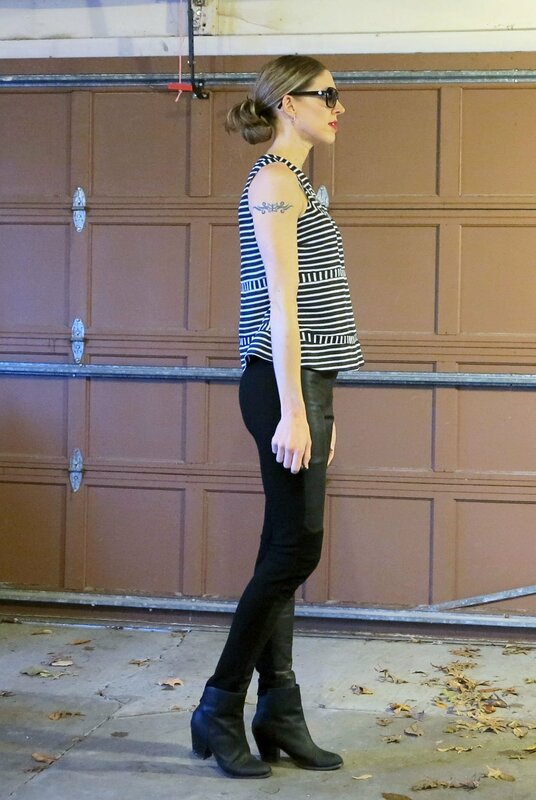 This entry was posted in silk, Tessuti Fabrics, top and tagged leather, leggings, silk, stripes, Tessuti Fabrics, Tessuti patterns, top on November 19, 2015 by Debbie Iles. I saw that top on their website, but didn’t love it. Your changes make it so elegant – and it doesn’t look boxy at all. Love the back placket and the panels. You used the stripes to their best advantage. Very cool, goosebumps and all. This looks great, I really like that style of neckline. Your modifications turned out awesome, I feel like they are one of those things that could have gone either way, but they really work with the stripes. I’m curious to know how you do a broad back adjustment – is it just your upper back (my problem too) or do you simply add width to the whole length? My standard broad back adjustment is to add 5/8inch wedge to the CB – I do it first up with all of the big four patterns and most others too. I’m really not sure why I didn’t add that much this time… I taper the wedge down to nothing – so the bottom of the top remains the same. This only works with collarless tops though – keeping the neck width the same (ie with shirt yokes or collars) requires a bit more creative slashing and manipulation. For anything with set in sleeves, I’ll also add 1cm to the end of the shoulder seam. Sometimes you may need to adjust the bottom of the armscye when you do this, if the shoulder seam was on a slope to begin with – just in order to maintain the same measurement around the armscye. So clever! Did you leave off the side slits or it is just where you are holding your arms in the photo? I love how you used the stripes in your top. Gorgeous. I love how you manipulated the stripe to get a more ornate design. It’s lovely and doesn’t look boxy at all!